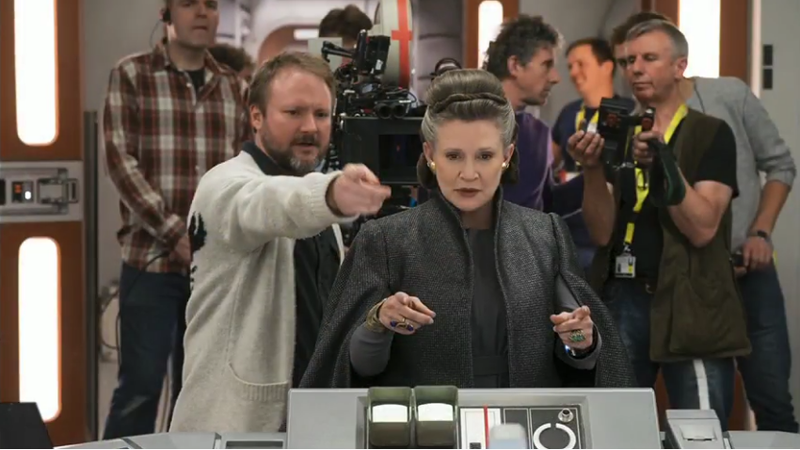 The Star Wars: The Last Jedi panel at Star Wars Celebration is currently underway, and director Rian Johnson has unveiled some killer behind-the-scenes photos he and others took, which give us a better look at the characters. Only don’t suggest the movie’s in black and white, because Johnson said no one’s supposed to tweet that. Finn, Poe, and Leia taking is easy. Don’t remove your helmet, Captain Phasma, your head’s your one weak spot! Johnson signing off on the Millennium Falcon. Daisy Ridley shares the first glimpse of Rey in the new film. Quick shout-out to my favorite photo from the collection so far (will be adding more as we get them): This lovely image of Carrie Fisher as General Leia Organa. Not only does it give us a better look at her fantastic outfit, but it also succeeds in breaking my heart yet again.